Pennsylvania colleges and universities began posting online reports Tuesday on documented cases of hazing over the past five years, from forced drinking and toe-licking to the dunking of students in ice water, as required by a law passed as a result of the 2017 death of a Penn State fraternity pledge. Tougher anti-hazing legislation was enacted last year in response to the death of Tim Piazza of Lebanon, New Jersey. It mandates that all schools that grant an associate's degree or higher put all violations of their own anti-hazing policies or federal or state laws on their websites. A sorority at Penn State-Altoona was suspended for a year over claims new members were subjected to being called "stupid" and "idiots" and were required to lick the toes of members. A Lehigh fraternity was dissolved for five years after a campus police officer found a notebook describing "coerced consumption of alcohol, lineups, servitude, sleep restrictions and other degrading actions regarding new members." A fraternity at the main Penn State campus was suspended for three years for making new members eat expired food, perform "acts of servitude" and get dunked in a large trash can filled with icy water for giving wrong answers during a biweekly lineup. Another also received a three-year suspension for making new members clean the house and do members' laundry. They also taped new members to poles or walls and threw food and other items at them. And they required new members to write and create "stall stories," described as "a pseudo pornographic newsletter" with pornographic images that were posted around the fraternity house. 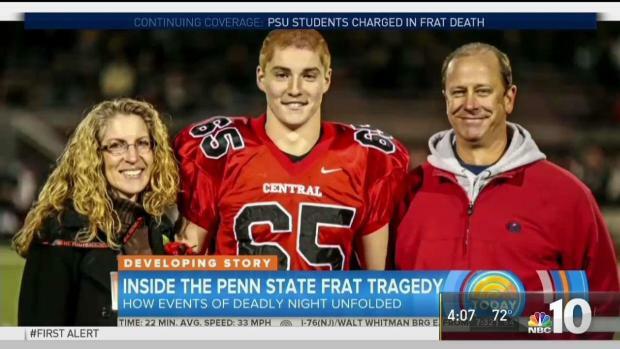 As to Beta Theta Pi, Penn State said five students were expelled, six suspended, two put on probation and 21 "took a conduct withdrawal from the university" as a result of the probe into Piazza's death. Three others were punished for other behavior that became known during the investigation — two were expelled and one suspended. Some reports had comparatively little detail. The University of Pittsburgh provided no information about hazing incidents beyond listing the rule that may have been violated. Indiana University of Pennsylvania described all 10 incidents simply as "hazing." Millersville University said it had fielded no reports in the past five years. "Parents can also use this as a resource to talk with their children about the decisions they are making while adding an additional layer of accountability to the schools and other organizations," Corman said.